Should be interesting. I'm looking forward to seeing the real version. 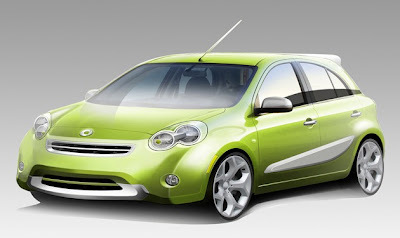 I think this collaboration is great, maybe Nissan can help drive down the cost of Smart's next offering. You know, If Smart ever really was smart they would continue to produce their current ForTwo, just price it like a sub-compact. In Portland Oregon the Smart ForTwo starts for ~23,000$US. Why would anyone buy this when they can get the same economy from a Toyota Yaris which starts at ~12,000$US? The failure of the Smart ForTwo is it cost double the price of other cars in it's class. I have driven a Smart ForTwo, for the size / what ammenities are included / and percieved build quality of the vehicle, I would pay no more than 10k for one "New". Americans are not going to pay big money for small cars, the proof is in the sales. It does sound pretty interesting. And just by the look of it, I would love to have one! 2 brains are better than 1.